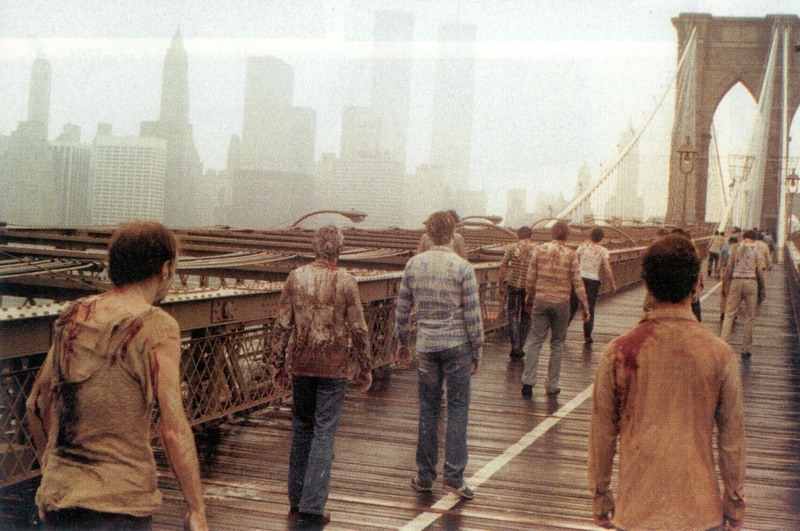 It was always going to be in the top 3 Zombie movies of all time. For me, it gets number 1 due to the fact that all other zombie movies have been infected by it (See what I did there?). It’s the all time greatest match-up, a shark versus a zombie. Only Lucio Fulci could create such a wonderful spectacle, the likes of which we may never see again. I love this movie, despite the fact that it starts a little slow and it’s badly dubbed (like most Italian movies). It was always going to come second on our zombie movies list, cause it’s as original as the movie I’ve put in first place. The Original, not the remake! This movie has slow zombies in it also (my favourite type). The aspect of horror I most love is the “don’t do that you idiot” side of things. Like when someone suggests spreading out to look for a mysterious lost team member. Don’t spread out you idiots, stick together… and live. The slow zombies make you feel this constantly. They’re walking so slowly, how can you not escape them? I like the first one, the second it the same but more comical. If you get a chance watch 4, it is pretty funny. I wish Peter Jackson had stuck to making movies like this and “Bad Taste”. Saddly he didn’t, instead he made overly long, boring movies like Godzilla, Lord of the Rings and f*cking Tin Tin. This is still one of the great zombie movies and deserves to be up here. Watch and lament Jackson’s fall from grace. The scariest zombie movies on our list so far, this movie is made so well, it could have been made by Americans… Kidding. Anyone who hasn’t seen this, should! Watch the trailer, buy it, borrow it, steal it, download it but watch it any way you can. Great movie to watch in a group! A classic, it makes every “zombie movies” list around and it’s on ours. The newest movie to make our list. This movie steals a lot from, and in some cases even improves on, the classics. This is one of those fun zombie movies to watch with friends. Very easy to watch and has a high re-watchability factor. Woody Harrelson is great and should appear in more zombie movies, he’s got the perfect demeanour. I love the start of this movie, when the song by Johnny Cash starts playing. The movie is kind of a mix between the original and zombieland. It takes itself slightly seriously, in an attempt to build up tension but also has a slap stick side to it. All and all, not the worst of the zombie movies and maybe deserves its place on our beloved list. I… don’t understand. Where’s Shaun of the Dead? Replace 28 Days Later with Shaun of the Dead … as 28 Days Later they are Infected, not Zombies. looking through i was sooooo disappointed not seeing Shaun of the dead and instead seeing 28 days later. iwas going to point out the same as maddie did. what the hell was going through the mind of the guy who wrote this list up! Seriously. Shaun of the dead is more of a comedy, than a zombie movie. Still not a good list. Where is Shaun of the Dead? It’s a TV show, not a movie, but In the Flesh is really good. definitely puts a unique spin on the whole zombie thing. Right. I quite liked this page. Then you go ahead and say that LOTR is boring. LOTR will never be boring. – And Shaun of the Dead should have made the cut. Call Lord Of The Rings boring one more time! I dare you!! World War Z wasn’t released at the time of this compilation.